Hello again, everybody. Bill Godfrey from C3 Pathways, here with a number of the instructors to talk about triage and transport and the challenges of integrating our medical roles in an active shooter event. Today I've got with me retired fire chief Tom Billington, both fire chief and paramedic. Another retired fire chief, Mark Rhame, also a paramedic. And not to be outdone, a third retired fire chief, Joe Ferrara, also a paramedic. Guys, thanks for taking the time to sit down and talk about this today. So just to kind of set the stage for us, when we talk about, in typical EMS, when you talk about mass casualty incidents, we always hear them throw out triage, treatment, and transport. It's kind of the three classic things that we talk about. But in an active shooter event, it's a little different. The triage officer, normally is ... The bus rolls over on the interstate, triage is walking among the bodies and doing their thing. But in an active shooter event, it's not safe to do that. But the job still has to be done. So Mark, can you open up by kind of talking a little bit about what's different about triage in an active shooter event? And how do we do the integration with law enforcement to set that up and get it rolling? In a traditional sense, the triage activity, or the triage person as you said, is walking amongst the individuals who are injured and trying to determine who is the most critically injured and which patient's gonna go first to the hospital, which patient's gonna get treated first. In the sense of a active shooter event, as you stated, that triage person, the person who's in that position, cannot go into that environment, because it may be still hot in the very beginning. It becomes warm when we take down the shooter or we put the shooter in a place where we can actually get to our patients safely with our rescue task force. But that triage officer is going to make and determine basically from a distance, utilizing rescue task force and standing right next to the tactical officer who has contact teams inside whose relaying information back to him or her about what kind of patients and how many patients and how severe they are so they can come up with their tactical considerations. For the triage officer in this environment, they're going to stand up rescue task force. And the rescue task force are a combination of our fire EMS people and law enforcement at a security envelope for that team to go in there and start counting our patients, start doing some very quick treatment on those patients, getting them to a location where they're all the patients are in one place, which we call our casualty collection point, determining the quickest route out of that location to an ambulance exchange point so we can load them up into the ambulances and move them off that scene, working hand in hand with our transportation officer who will be standing next to us. One of the considerations we have to have, though, is a triage person who's in that position, is they have to go down to a safe environment where that tactical officer is. So there is a consideration for that triage officer working with our medical branch to say, "Is it safe for me to send my people into that location? Is it safe for me to send my triage person and my transport officer down to that location so they can be standing next to each other talking face to face, coming up with their strategy and tactics?" So once that area is determined to be safe for them to go to that area -- it's a warm zone, so there's still some consideration of a threat -- but they can go down to that location. They cohabitate with them. At that point in time, they can stand up their rescue task force and get them inside and start working on these patients. Fantastic. 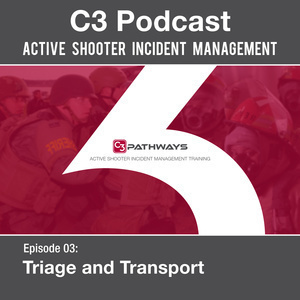 Joe, we were talking on another podcast with the law enforcement guys who really, really were talking about the importance of co-locating triage and transport with the tactical group supervisor to be able to work the problem very directly. Can you talk about, from the fire EMS perspective, from the medical perspective, why is it so important to put the triage and transport supervisors forward with the tactical group supervisor? Why can't they just take it over and run it and do what they gotta do? Why is that co-location location so important? Well, I think if we look into some of the common problems that occur on scenes from an incident management perspective, it's always communication. Communication always seems to be the number one gap. So in one scenario, we could take our triage and transport group supervisors, and they could be in a fire command post, and they can be directing the rescue task force and directing the ambulances, but yet the gap there is they're not talking to tactical. Tactical has the operational picture of the scene. Tactical knows where the boundaries of the hot zone is. Tactical knows about the security threats occurring. Tactical knows when it's safe to start the rescue operation. So if we're gonna create a gap by not co-locating, by forcing triage and transport to pick up a phone, or worse yet, have a cross-patch radio channel that may or may not work ... Because typically, fire and EMS are not on the same radio system as police. So why not, when the medical branch is stood up, and the medical branch sends triage and transport group supervisors as a command function, as an ICS function, downrange, send them to the tactical folks? The tactical guy, who was maybe that fifth man. I know we talked about it in a past podcast. It's not the counted fifth man. It could be the fifth, sixth, seventh. Whoever that law enforcement person is that's running the tactical operation, who better to have the folks in triage and transport that are gonna be moving patients and getting them out of scene as expeditiously as possible, why not have them with the law enforcement supervisor? By doing that, those triage folks will have no question about whether it's safe to put an RTF in with a security bubble. The transport group supervisor will have no question about where the ambulance exchange points need to be, because getting that information directly from the person that has the operational picture, the tactical group supervisor. So Tom, Joe, obviously, talking very passionately about a lot of the challenges in understanding the security side of this thing, which, of course, for fire and EMS folks, that's not our area of expertise. That's not normal for us. But being there with tactical to get that, can you talk a little bit about some of the difficulties or the challenges in getting the patients transported? I mean, okay ... the law enforcement's neutralized the threat. The rescue task forces have moved downrange. They've got contact with the patient. We're ready to get the patients out of there. What are some of the challenges that are faced on the transport side in making that happen in a timely fashion? Well, one of the things we discuss is neutralizing the threat, which is done. So now we're fighting the clock. And as a transport group supervisor, you are that final cog in the wheel to get these patients to the correct facilities as soon as possible. And so it's really important that the transport group supervisor have situational awareness. They should know where the hospitals are located, the best routes, how many patients each hospital can take. And this has to be done rapidly. Again, we're fighting the clock. We have to get these injured people to a hospital as soon as possible and to get them treated. Again, by being located with the other groups, you have a better chance of understanding the clarity of what's going to happen, where you want to send them. And it's really a important task. Tom, walk me through the process of how the rescue task force who has the patients picks a spot to hand them off to the ambulances. Walk me through how that happens and what that looks like. Okay, when the rescue task forces are ready for the ambulances, the first thing they need to do is establish an ambulance exchange point. It has to be a location close to their casualty collection point. It has to be easy access. And obviously, there needs to be security. So once they have identified a location close to the casualty collection point that is outside that the ambulances can come and leave freely, they need to make sure they have a security bubble, and set up the ambulance exchange point. When all of this is completed, only then do we bring the ambulances in. And of course, we bring them in one at a time with security, load the patient. This is a very important point. When we load the patient, we're not sitting there treating the patient anymore. We do not want to be sitting target, as you may call it. We want to get the person moved and get on the way to the hospital. So it's a very important part. Remember, security's important. Remember, don't box up your ambulances one at a time, and it should go pretty good after that. So mark, talk a little bit about the challenges that are faced realistically. The triage and transport group supervisors, they're physically co-located, maybe at the trunk of a car. Maybe they're working off a desk somewhere, or they're just standing in a parking lot, but they're working with tactical, and you've got these three people that are putting their heads together, trying to kind of coordinate that ballet. Talk a little bit about what are some of the typical challenges you see and maybe some of the ways to overcome those challenges. Well, probably one of the biggest things is they've got to trust the teams that are inside. The tactical officer along with the triage and transport have eyes inside of the building. They are with the patients. They have identified a casualty collection point, and they are giving a recommendation for an ambulance exchange point. Those individuals who are outside, who are running that inner perimeter, that warm zone that was a hot zone previously, being the tactical officer, that triage person and that transport person, they have to trust the people inside to give them a good recommendation of a good pathway from that place that they're bringing their patients to, that casualty collection point, to the outside as an ambulance exchange point. Simply standing outside and looking at a map doesn't always work. We can all look at maps, and especially if you get a multi-story structure, and think we can determine the quickest route from inside the structure to the outside where the ambulances are waiting to take the patients to the hospital. But truly, you've got to trust the people inside who have physically walked it and who have an understanding of where the quickest methodology or the quickest path to get them out. You've got to trust them to make a good decision, a good recommendation. Now, you have every right as a triage officer, or a tactical officer, to overrule that, because you're seeing the bigger picture. You own that inner perimeter. You may see other threats they're not seeing, or other considerations. But really, you've got to trust those people inside to given you good intel, good patient counts, and a recommendation of the quickest methodology of getting those patients off the scene. So, Joe, I'm gonna put you on the spot with this one. Why not just drag or shuttle the patients out of the hot and warm zone back to some cold zone area where you can lay them out, really do a good assessment on them, treat them if you need to and then load them in more of a traditional transport area where you've got a line of ambulances? Why not do it that way? Well Bill, that's certainly a good perspective, and that's traditionally the way we've done it in EMS. We've set up those treatment, transport, and triage areas. We've set up the tarps and we start moving patients out from there. However, as we've stressed in active shooter events and learned lessons from the military, when people are shot ... time. Time is the killer. So the longer that we let these people sit on scene, then the less their chance of survival. The only thing that is gonna save these people is rapid movement, and rapid transport to an appropriate facility. So we have our choice here. We co-locate with tactical. We organize a rescue task forces downrange. We push them to do indirect threat care to get the patient briefly stabilized, and we move them directly to ambulances. So if we're gonna move once from a casualty collection point to the back of an ambulance, why not make it the shortest move? And that shortest move is from inside the CCP to outside in the ambulance exchange point. Rather than moving them inside the CCP, over to the cold zone, and now we're gonna re-triage them and retreat them and load them back into ambulances and cause another delay. So because of that killer of time, the best thing to do here is to get those patients directly in the AEP, directly in the ambulance and on their way to the appropriate facility. Let's cut out the other steps that are killing our patients. Good points. Good points. Tom, from your perspective ... I know you've done a lot of training on the RTF side, and on the transport side and trying to help people integrate that ballet, I'm gonna call it ... What are some of the challenges you see? Where do people slip up? What are the common mistakes that you see in that process of trying to get into the patients quickly, do whatever emergent ... as Joe said, emergent indirect care you need to, and then get on an ambulance and get out of Dodge? What's the common mistakes you're seeing? Well, the first is hesitation. You need to make sure that, when you're on a RTF, a rescue task force, that you're comfortable, that the law enforcement officers are going to protect your life, and the law enforcement officers are comfortable, that you're going to listen to them for safety reasons. So the first thing is, don't hesitate. You need to move in as a team and be ... Rapidly assess these folks. Start treating them as quickly as possible. On the transport side, some of the tangles we get into, I'll give you an example, is we think a lot about helicopters. Transport isn't only by ambulance, it can be by helicopter. But a problem with that is as a transport officer, again, situation awareness should let you be able to decide is it quicker to put them in the back of an ambulance and drive to them the hospital? Or is it quicker to drive an ambulance to a landing zone, transport the patient to a helicopter? The helicopter crew has their procedures that they have to do before they take off. We may even be adding time by using that helicopter. So it's just another issue you have to weigh out. Again, we're fighting the clock, so the quickest way is always the best. Mark, what about your perspective? What are the common mistakes that you see? Well, Tom hit a very good on there in regard to delays that we artificially create. The delays that aren't driven by the shooter, who has been taken down, secured. The delays of believing that you can't enter a building after you've secured that area, even though the threat still may be within that hot, warm zone. Those delays are what's killing these patients. And we've got to come to the conclusion, the reality, that we're creating a lot of these problems ourselves. We can have the solution right in front of us with proper training, with practice, with integrating our response, but we've got to eliminate these delays by trusting our judgment on these issues. There is nothing wrong with entering a structure where you still have a threat in it, so long as you've held that threat at bay, you've placed that threat somewhere that it's not gonna harm anyone else. That it's law enforcement it's held that person in place. And then you can send in your rescue task force, get those people off the scene, even though you haven't taken down the threat. So we can't get into this mode where we're gonna back up a half a mile or a mile and wait for the scene to be totally secure and become cold, because those patients are gonna die right in front of us. We've got to get into that environment where delays are killing these people, and we've got to be a little bit more aggressive. Joe, if you were giving advice to a new, young paramedic, or a young company officer, who is gonna have to play the triage or transport role, what's the one piece of advice? In fact, I'll pass this question to each of you guys. What's the one piece of advice that you would give a young medic or a young company officer who's gonna have to play either the triage or the transport roles in an active shooter event? What's the one piece of advice you'd give them? Don't waste time. One of the biggest problems that I always saw as a supervisor on the scene, as a company officer, was we do a great job getting the patient extricated, and suddenly, we get them in the back of the ambulance and we think some magic is gonna happen in there and the patient is gonna be cured. Get in the truck. When the patient is loaded, get that driver up front and let's move to the hospital. Trauma patients will benefit from surgery, not from paramedic intervention. So don't waste the patient's time. It's way too valuable. Tom, how about you? One piece of advice you'd give to the young paramedic or company officer? He or she must trust the people that are in those positions, that are in the RTF. Trust them. The only time you want to override a decision is if it is a danger to health. If there's a threat they don't know about. But other than that, you have to let these people do their jobs. Give them the tools they need. Support them, and trust that they are making the right decisions. And overall, you should have a better outcome. Get organized. I'll give you an example. If you are placed in the position of transport, you need to find out what hospitals are able to take what type of patients right up front. You cannot wait until the patients are starting to be dragged out, placed in the back of an ambulance, and then calling dispatch and asking hospitals what patients they can take. You've gotta be way ahead of the curve on this issue and get organization very, very quickly. Get that information that's necessary for you to be successful in getting those patients off the scene as quick as possible. Great stuff. Great stuff. Well, that's our time today, chiefs. I want to say thank you guys for sitting down and taking the time to talk about this. I enjoyed it. Look forward to doing some more of these in the future.